If you want to get "The Dr. Oz Show" tickets in advance, request free tickets to see The Dr. Oz Show online. After your request, you will be notified by email only if they are able to accommodate your request. Check the website frequently to find newly released tickets. There is a four-ticket limit per request. Advance ticket holders may also have the opportunity to be featured in the show -- before the taping, we got an email with several different segments that were looking for audience contributions and instructions for expressing interest in them. Audience members at the show we attended talked about having chicken pox, headaches and some even demonstrated foot exercises. Stand-by tickets are distributed on the same day as the show tapes at the studio, located at 320 West 66th Street. Standby tickets are available for both the morning and afternoon tapings at 8:50 a.m. and 1:50 p.m., respectively. Upon arrival, we were allowed inside and had our names checked from the list of ticket holders before passing through a metal detector and having our bags searched. Around 9 a.m., audience members lined up to take an elevator up to the studio level. In the audience waiting room, there was a place to hang coats, water to drink and plenty of seating. There was also an opportunity to use the restroom before the show began. There was even a Dr. Oz "Healthie" spot where you could take a photo of yourself (with props, if you wanted) before the taping. The taping began just after 10 a.m. and lasted about 1.5 hours, during which time they taped roughly half-a-dozen segments for the show, which will air about a week and a half to two weeks after taping. Most segments were fairly short, so there were lots of short breaks throughout the time. The taping concluded at about 11:30 a.m. and we were back out of the studio with our coats before noon. From start to finish the experience lasted roughly three-and-a-half-hours, about 90 minutes of which was in the actual studio. The Dr. Oz Show typically tapes two shows daily on Tuesday, Wednesday and Friday. The morning show tapes at 10 a.m. and generally lasts until about 11:30 a.m./noon. The line-up for ticket-holders begins around 8 a.m. and you must arrive no later than 8:45 p.m. or you risk having your spot given to someone on the standby line. The afternoon show tapes at 3 p.m. and generally lasts until about 4:30/5 p.m. The line-up for ticket-holders begins around 1 p.m. and you must arrive no later than 1:45 p.m. or you risk having your spot given to someone on the standby line. You'll need a photo ID with the name matching the reservation to claim your tickets. Large packages, shopping bags, suitcases, etc. are not permitted in the studio. Small purses are allowed. Smart casual dress is suggested. The studio instructions request that folks wear bright colors and look "Trendy/Classy/Chic. Although we were warm in the actual studio, the other areas of the building were chilly, so I'd recommend bringing a sweater or jacket if you're attending a taping. 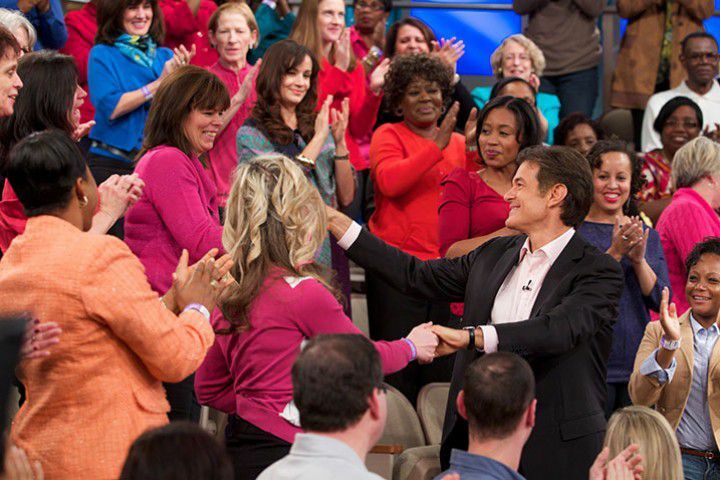 If you're local to the NYC-area and have a flexible schedule, consider signing up for the Dr. Oz Show's "On Call" audience list, and you might be invited to last minute tapings. Closest subway: 1 to 66th/Lincoln Center.